Vibrational Essences can delight spa-goer's emotions and invite positive change. The LightBeings Vibrational Essence collection consists of 47 focused essences (also known as "energies") that help users to overcome life's hurdles and achieve their full potential through Vibrational influence. Applying the essences synchronizes the aura with the Vibrational energy in the essence. This opens the user to change, emotional walls come down and resistance is released so spiritual healing and growth can begin. Anyone seeking personal improvement and growth will be amazed at what unfolds - seekers find their answers from within. When LightBeings are incorporated with hands on services like massages, Acupuncture, hydrotherapy, body treatments, facials, reiki, hot stone massages (even manicures & pedicures), they can create a beautiful journey of loving restoration for the mind, body and soul. LightBeings can also be sold retail in Day Spas and Wellness Centers. Simply anointing ourselves every morning with LightBeings Essences is both enjoyable and meditative. Users can begin each day centering their intentions with essences that will inspire them. Select the the theme you need right now. Use only up to 3 LightBeings Essences at a time for at least 30 days. Have you ever smelled a product so yummy you could eat it? Well this one takes the cake! This scrumptious hand & foot mask smells decadent. If you love sweet and buttery baked apples, meet your match. Warning: Hunger pains may start to evolve. Don't do this on an empty stomach. After doing the standard pedicure procedures (i.e. Soak, scrub, massage - with apple scented foot cream), it's time bask the client in sweet candy apple heaven! Start by mixing the Soho Oatmeal powder with the liquid Apple solution. After applying generously to feet & hands, it will harden right before your very eyes. Clients will begin to feel cool and more refreshed as the mask sets -- they won't want you to take it off. Peel off and proceed to shape & polish toe nails... candy apple red perhaps? SO not your ordinary self tanner. As an Esthetician I am naturally self tanner-phobic. The thought of putting pore clogging and unbeneficial products on my skin, literally makes my hair stand on end. Oh, Did I mention the nightmares of the oomp-a-loompa look? That was until I tried Vita Tanz. This fearless self tanner "had me at hello". Not only did my skin have a healthy glow and my pores were squeaky clean, my skin felt so soft and hydrated. As Vita Tanz washed off my skin, I didn't even have that dreaded blotchiness of remaining product still lingering. Vita Tanz even comes with a buff applicator to protect your fingers. Fabulous! In conclusion anyone looking for that Bermuda tan in a bottle, your product has arrived. Vita Tanz has been discontinued by the manufacturer, but Pure Spa Direct offers the INCREDIBLE Extended Vacation Moroccan Mineral Self Tanner and Shimmering Sands Facial Tanner - check them out today! Professional Tanning Services: Adding the Perfect Spray Tan to your Menu. According to an October 2006 Mintel Report, sales of sunless tanners have experienced growth of 429% from 2001 to 2006. With this kind of growth, it is no wonder that every year more and more Day Spas, Dermatology Clinics and beauty related businesses are adding sunless tanning products and services to their menus. It seems that sun bathing beach bodies are throwing in their towels for a faux glow and the spa industry is taking notice. 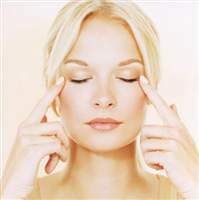 Every year women are spending more on professional procedures to reverse the signs of aging. Lasers, injectables, peels and resurfacing treatments are the anti-aging arsenal of services available. With all the money consumers are investing in reversing sun and age damage, it seems only natural that sunless tanning would be an ideal option for obtaining a "wrinkle free" tan. The value of adding sunless tanning to your business is obvious and you probably want to know where to go from here. If you have been to any beauty related tradeshows you have likely seen that there are dozens of companies all touting they have got the best sunless system for your business. It can be quite confusing, and they all sound great, but what is the right choice? Companies selling systems at trade shows can range from $300 - $24,000+. We can help you sort through some of the different systems available. Pros and Cons of different Equipment Options - these are generalizations - and some variation can be expected within different brands and product lines. This is a general guide to help you chose what fits your business best. Airbrush and compressor systems were the original application medium for Airbrush Tanning. They have been used successfully for a few years, with a large following. I n recent years techs have started trading in their airbrushes for the speedier Spray guns, LVLPs (Low Volume Low Pressure) and HVLP (High Volume Low Pressure) systems. The airbrushes have the advantage of small size, low cost entry level systems, and less mess with proper adjustments and technique. Many people start with an airbrush, and advance to a speeder "gun" system as their resources permit. Typically those who have learned to use a "Tanning Grade" Gun system, with proper adjustments and technique, don't go back to an airbrush. Smaller tank compressors, will need to "refill" with air more often with a spray gun, a larger tank eliminates this problem. Proper gun adjustments are important. Adjusting the flow regulator on the gun can generally improve transfer efficiency. A spray gun, like the models by Iwata and Paasche are the bridge between an airbrush and an HVLP gun. They spray more volume of product then an airbrush, but less then an HVLP. They do not blow air as you go, like an HVLP or LVLP gun will do. These are smaller than most HVLP guns. Think of them as an airbrush with the ability to spray much more product at once. Some companies sell Spray guns, that they also call LVLP or HVLP systems. There is much controversy on whether these are truly an LVLP or HVLP gun. Technically a spray gun has a tip PSI of 10 or greater. HVLP and LVLP must have a tip PSI of less then 10. Most HVLP guns have a tip PSI of 4 to 7 - though Apollo has an HVLP model with 1 PSI at the tip. LVLP guns have a tip PSI of 1 PSI. Because of the larger air volume requirements - HVLP and LVLP systems are paired with a small turbine, or a very large compressor (no pressure loss from waiting on tank to fill, as one may get with a smaller tanked compressor). For ultra precision, some techs prefer to use a spray gun for the body and an airbrush for details smaller areas (feet, hands and). Both can certainly be used for all body areas with very good results. Fast application - 3 to 5 minutes, most units 4 to 7 PSI at tip, Apollo version is 1 PSI at tip. An HVLP is a larger bore device then a standard spray gun or an LVLP, with a large air hose, and large inner passages. This creates a large amount of air volume, and a very fast spray application. Because of the air volume requirements, a Turbine is the standard air delivery device. To be classified as an HVLP, the tip PSI must be around 4 to 7 PSI. Apollo Spray Systems have an HVLP brush line for spray tanning with the larger HVLP size, but the lower tip pressure of 1 PSI. Tank models will need to refill often with a spray gun, unless a larger tank is used - short spray bursts will work best at lessening rapid air depletion. For spray guns - a small compressor will need to run continually to provide consistent airflow for an airbrush or spray gun. Smalls compressors will not provide enough airflow for a spray gun to effectively spray solution, and can also cause fast system burnout. A compressor with storage tank, often has and "Auto On-Off" feature. This allows the compressor to shut off when tank is full of air then cycling on again only to refill the tank as needed. Can produce a lot overspray. An overspray booth is recommended. Look for a silent compressor with an airbrush or spray gun. A spray gun and HVLP can also provide lower overspray options, but equipment and technique must be correct. HVLP guns with the lower tip PSI have the best transfer efficiency onto the skin’s surface. This can also create less overspray. Why buy "Professional" grade instead of that cheap unit at Harbor Freight, Home Depot, or Wal-Mart? Obviously the first consideration is - "How often will you be using your equipment?" If you are simply servicing a few people a week - a $2,000 HVLP system is probably a lot more equipment then you need, or will ever utilize. For low client volume, an inexpensive small compressor and airbrush is probably your best choice. If you have a high volume of clients, a small compressor and airbrush system could hold you back. You may burn it the equipment out fast, and then have excess down-time while you wait for warranty repairs. This may mean lost customers, who may now go find your competition to maintain the great tan you gave them. So take some time to assess your situation and your goals both long and short term. Ask yourself how much effort your business plans on advertising and marketing your new service. A poor quality unit, with a good warranty is still a poor buy - if you have to send it in for repairs or replacement every two months. A cheap system with no after sales support can be a real nightmare if you have any difficulties. Rather, look at the products involved, the quality, the services offered, the after sales support, the training or resources available. And find out what other pros, who are in the business, like or hate and why? Your technician should be well practiced in his/her technique and well educated in the Do's and Don'ts of Airbrush tanning. Technicians are responsible for properly educating your clientele on how to effectively prepare and care for their sunless spray tan so that they remain happy, loyal clients. You can use the best tanning solution in the world, but if your technician is not well practiced and educated, your spray tanning business could be in jeopardy. What a client does before or after a spray tan can be critical to its final results. Not properly preparing for their sunless service or improperly maintaining their sunless tan after their appointment can cause poor results. Offer your clients retail products that were specifically developed to keep their sunless tan looking beautiful and bright. Daily moisturization and occasional gentle exfoliation are essential to keeping an airbrushed tan looking flawless. Pure Sunless® uses only the finest grade of DHA & Erythrulose in our premier formulations. In combination with our exceptional array of effective anti-oxidants, extracts and moisturizers, Pure Sunless® can outperform solutions that state the same active percentages in their products simply because our formulations, ingredients and quality far exceed industry standards. Water - an ever present amenity in spas, so why not make it special? One of the things I look forward to when spa-going is the quiet time I have while waiting for my treatment. Great spas have a wide assortment of loose and bagged teas, infused waters and juices. It is so fun to try all these varieties before and after treatments and it really helps commence "me time" mode. From time to time I still stumble accross spas offering little to no beverage assortment for guests. Maybe they will have a pitcher of water (with a lemon wedge thrown in for good measure) and a generic chamomile tea blend. That is almost as bad as being handed a small Dixie cup filled with lukewarm tap water after a great massage! Sometimes it is the small details that leave the lasting impressions. So why don’t more spas offer their clients something special to drink? Water is an important accent on the spa experience and it can easily be transformed from ordinary to extraordinary. What a great way to remind the guest that every detail of their experience is attended to. 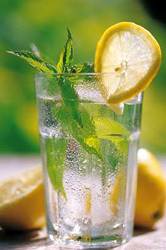 Pure Spa Direct has some ideas on how to enhance your beverage selection to your spa guests. It hardly takes any time to prepare such delightful treats. So here are some simple ways to liven up your drink offerings to clients this Spring & Summer. Place crushed mint leaves in a pitcher. 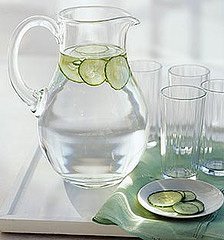 Fill the pitcher with water and add 1/2 cup of lime juice. Stir well and garnish with whole slices of lime and a mint stem. Combine crystallized or candied ginger with club soda and garnish with lemon slices. Also note: For a stronger taste, let the water sit in your refrigerator for an hour prior to serving.